14.08.2011 - In the final the Danes secured their third W19 gold by beating the hosts, the Netherlands, in Rotterdam. 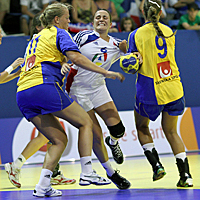 11.08.2011 - The order of the two games at the 2011 Women’s 19 European Championship has changed. 11.08.2011 - Denmark, Austria, the Netherlands and Serbia battle for gold at the Women’s 19 European Championship in the Netherlands. 08.08.2011 - The three best teams of 2009 were already eliminated in the Preliminary Round of the W19 European Championship in the Netherlands.